Background: Herein I describe my >12-year experience with laparoscopic common bile duct exploration (LCBDE). Methods: From 21 September 1989 through 31 December 2001, 3,580 patients presented with symptomatic biliary tract disease. Laparoscopic cholecystecomy (LC) was attempted in 3,544 of them (99.1%) and completed in 3,527 (99.5%). Laparoscopic cholangiograms (IOC) were performed in 3,417 patients (96.4%); in 344 cases (9.7%), the IOC was abnormal. 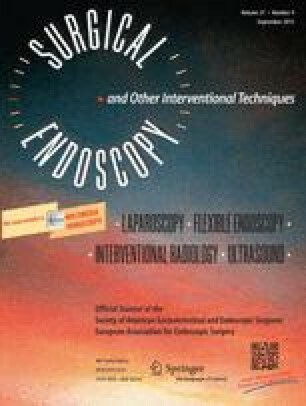 Forty-nine patients (1.4%) underwent preoperative endoscopic retrograde cholangiopancreatography (ERCP), and 33 patients (0.9%) underwent postoperative ERCP. LCBDE was attempted in 326 cases and completed in 321 (98.5%). It was successful in clearing the duct in 317 of the 344 patients with abnormal cholangiograms (92.2%). Results: The mean operating time for all patients undergoing LC with or without cholangiograms or LCBDE or other additional surgery was 56.9 min. Mean length of stay was 22.1 h. The mean operating time for LC only patients (n = 2530)—that is, those not undergoing LCBDE or any other additional procedure—was 47.6 min; their mean postoperative length of stay was 17.2 h. Ductal exploration was performed via the cystic duct in 269 patients, (82.5%) and through a choledochotomy in 57 patients (17.5%). T-tubes were used in patients in whom there was concern for possible retained debris or stones, distal spasm, pancreatitis, or general poor tissue quality secondary to malnutrition or infection. In cases where choledochotomy was used, a T-tube was placed in 38 patients (67%), and primary closure without a T-tube was done in 19 (33%). There were no complications in the group of patients who underwent choledochotomy and primary ductal closure without T-tube placement or in the group in whom T-tubes were placed. Conclusions: Common bile duct (CBD) stones still occur in 10% of patients. These stones are identified by IOC. IOC can be performed in >96.4% of cases of LC. LCBDE was successful in clearing these stones in 97.2% of patients in whom it was attempted and in 92.2% of all patients with normal IOCs. Most LCBDEs in this series were performed via the cystic duct because of the stone characteristics and ductal anatomy. Selective laparoscopic placement of T-tubes in patients requiring choledochotomy (67%) appears to be a safe and effective alternative to routine T-tube drainage of the ductal system. ERCP, which was required for 5.8% of patients with abnormal cholangiograms, and open CBDE, which was used in 2.0%, still play an important role in the management of common bile duct pathology. The role of ERCP, with or without sphincterotomy, has returned to its status in the prelaparoscopic era. LCBDE may be employed successfully in the vast majority of patients harboring CBD stones.